The index opened above the dotted line and meandered along without much purpose waiting for the RBI’s monetary policy, and the policy did disappoint with just a small cut on SLR from 24% to 23%. Nifty nose-dived below the 5160 level where the responsive buyers took control and Nifty galloped away to the high of the day at 5234. The index ultimately closed just below today’s high at 5229.00, a gain of 29.20 points. OI Table got some face lift with 5100PE now looking like a good enough support on the downside. 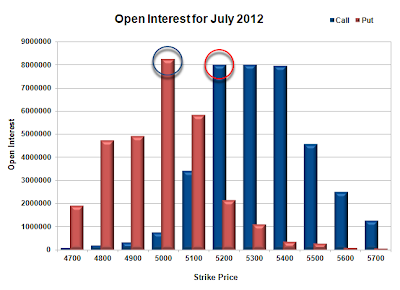 Call option 5200-5700 added 12.2 lacs huge amount of OI, with small liquidation seen at 5100 and lower strike prices. Put Option 5300-5100 and 4900-4700 added 33.5 lacs huge amount of OI, with small profit booking at 5000 strike price. 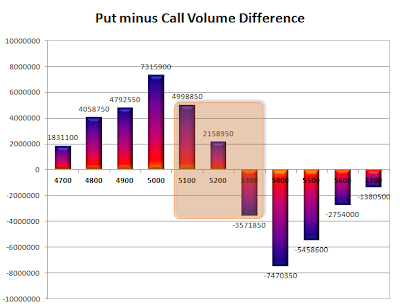 Highest accumulation on Call option 5400 at 57.6 lacs & 5500 at 53.9 lacs whereas Put option 5000 at 82 lacs & 5100 at 56.7 lacs. Nifty Open Interest is at 2,21,93,100 up by 1,48,750 with increase in price, most probably huge long build-up. Bank Nifty Open Interest is at 20,65,850 down by huge 29,175 with small decrease in price, most probably some long liquidation. FII’s bought 4.12 lacs Futures, most probably long addition, as their OI also increased by 5.15 lacs, and their average price per contract comes to around 5116. FII’s future open contract as on date is 5.07 lacs. PCR Open Interest (Volume) is at a healthy value of 1.373. Support at 5100 looks good with addition of 3.95 lacs of OI for the day and OI now around 57 lacs below that at 5000 with highest OI of 82 lacs. 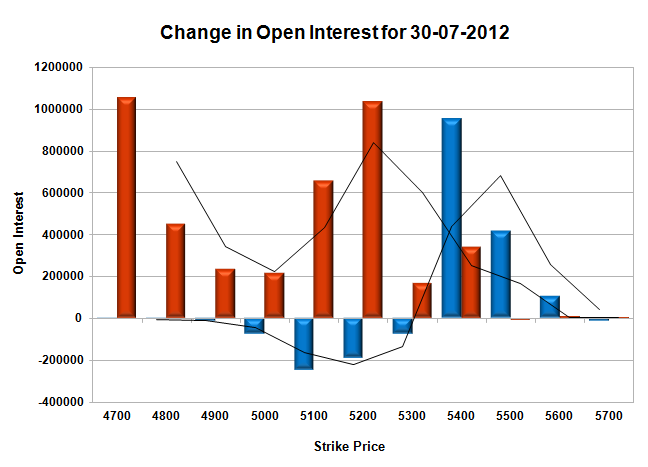 Resistance at 5300 with OI above 41.5 lacs and above that at 5400-5500. Range as per Option Table is 5155 -5264 and as per VIX is 5185 - 5273 with 5200 as the Pivot. The index gapped up around 5130 on the back of good global cues and steadily made its way up with not much of a resistance in between to close just below 5200 at 5199.80, a huge gain of 99.95 points. It was a perfect trend day for the Bulls with the Bears taking the day off. Looks like market participants are anticipating lollies from the RBI Governor. 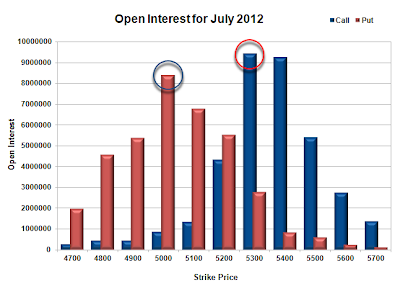 OI Table looks very good for the Bulls with huge addition 5100 and 5200PE Levels. 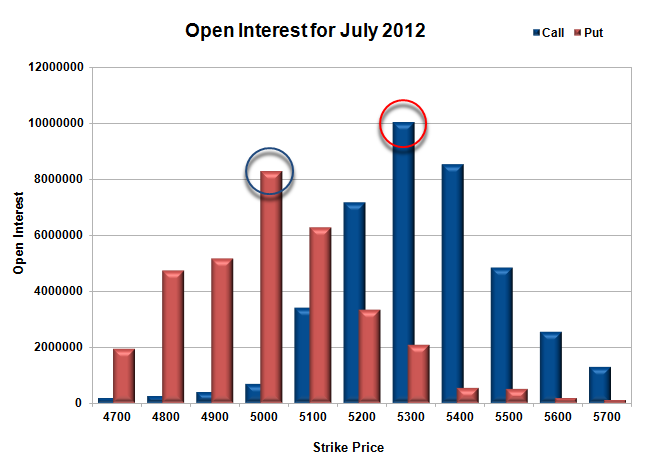 Call option 5400-5600 added 14.7 lacs huge amount of OI, with liquidation seen at 5200 and lower strike prices. 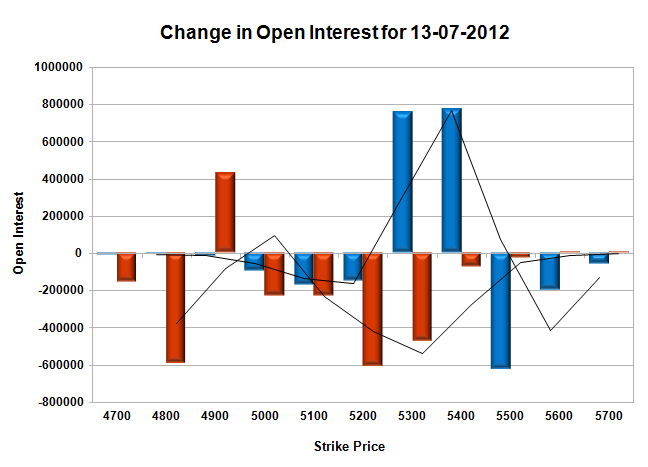 Put Option 5400-4700 added 41.5 lacs huge amount of OI, with not much change in other strike prices. Highest accumulation on Call option 5400 at 55.3 lacs & 5500 at 53.4 lacs whereas Put option 5000 at 84 lacs & 5100 at 52.8 lacs. 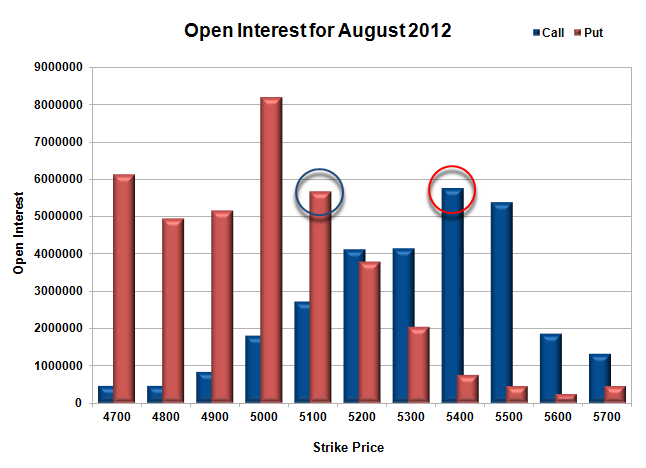 Nifty Open Interest is at 2,20,44,350 up by 9,36,450 with increase in price, most probably huge long build-up. Bank Nifty Open Interest is at 20,65,850 down by huge 1,29,725 with increase in price, most probably huge short covering. FII’s bought 1.21 lacs Futures, most probably long addition, as their OI also increased by 21.86 lacs, and their average price per contract comes to around 5105. FII’s future open contract as on date is 4.97 lacs. PCR Open Interest (Volume) is comfortably moving up and now at 1.333. Support at 5100 got stronger with addition of 6.54 lacs of OI for the day and below that at 5000 with highest OI of 84 lacs. 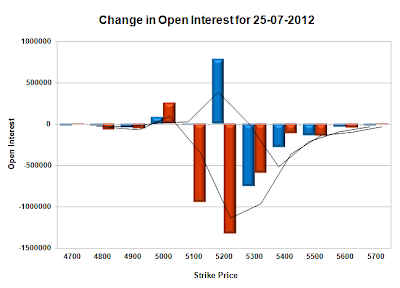 Resistance at 5200 looks vulnerable, with decrease in OI and above that at 5300-5500. Range as per Option Table is 5130 -5236 and as per VIX is 5155 - 5245 with 5180 as the Pivot. The index gapped up above 5100 on the back of super global cues and galloped away towards 5150. The responsive sellers got active around 5150 and moved the index below 5100 level towards 5080. Buying again emerged around 5080, but still Nifty closed below 5100 at 5099.85 a good gain of 56.85 points. Looking at the way the sell-off happened fr0m 5150 levels, the Bears are still holding upper hand at higher levels but the OI Table looks good with OI at 5000PE level crossing 80 lacs with the first day of the series. 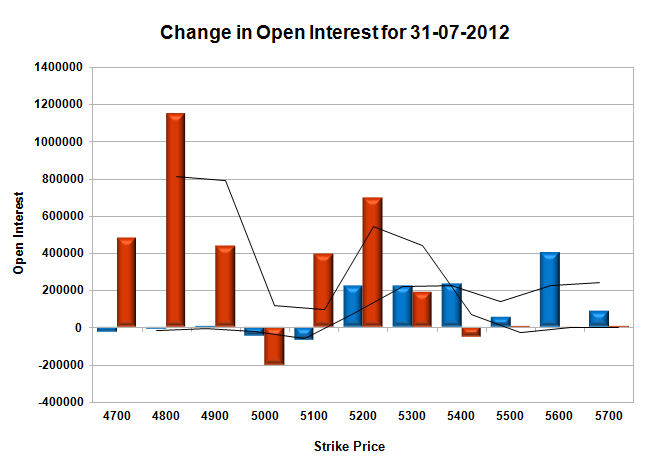 Call option 4900-5600 added 39.7 lacs huge amount of OI, with small addition at lower strike prices. Put Option 5200-4700 added 34.7 lacs huge amount of OI, with small liquidation seen at 5400 and above strike prices. 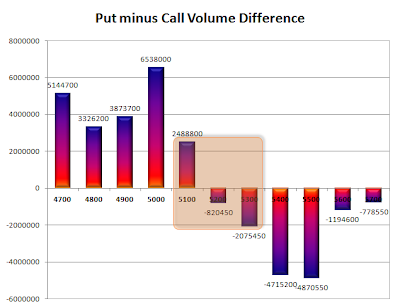 Highest accumulation on Call option 5500 at 49.2 lacs & 5400 at 45.7 lacs whereas Put option 5000 at 81.8 lacs & 5100 at 46.2 lacs. 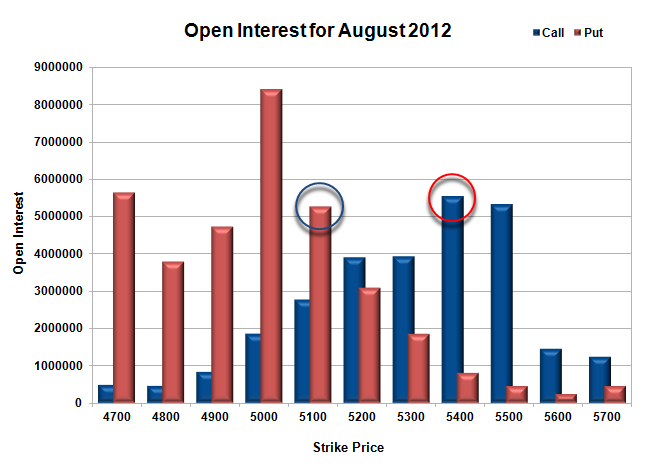 Nifty Open Interest is at 2,11,07,900 up by 5,61,300 with increase in price, most probably huge long build-up. Bank Nifty Open Interest is at 21,95,575 down by huge 4,09,350 with increase in price, most probably huge short covering. FII’s bought huge 30.19 lacs Futures, most probably long addition, as their OI also increased by 6.08 lacs, and their average price per contract comes to around 5036. FII’s future open contract as on date is 4.53 lacs. 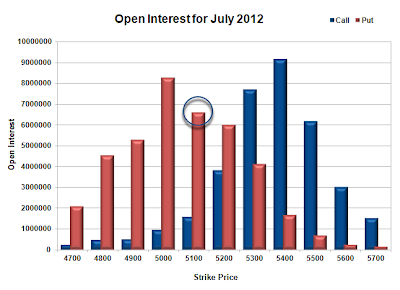 PCR Open Interest (Volume) is comfortably placed at 1.249. Support building up around 5100 with addition of 8.24 lacs of OI for the day and below that at 5000 with highest OI of 81.8 lacs. Initial Resistance at 5200, with OI of 40.96 lacs and above that at 5300-5500. Range as per Option Table is 5057 -5160 and as per VIX is 5056 - 5146 with 5110 as the Pivot. The index opened up but was sold off to just below 5100 and remained there for the better part of the day, and when it seemed that we are going to see a very dull expiry, all hell broke loose. As 5080 on the downside was broken, the 5100PE Writers panicked and Nifty saw a huge sell-off to the lows of the day around 5030. Nifty for the day closed weak at 5043.00 a huge loss of 66.60 points very close to the psychological level of 5000. At start of the series, the Option OI Table seems to have made a base around 5000 level, need to keep a watch for the next few days. 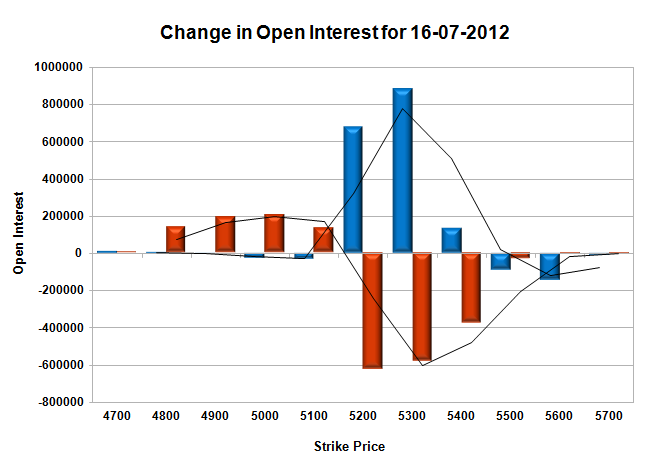 Call option 4900-5700 added 49.5 lacs huge amount of OI, with small addition at lower strike prices. 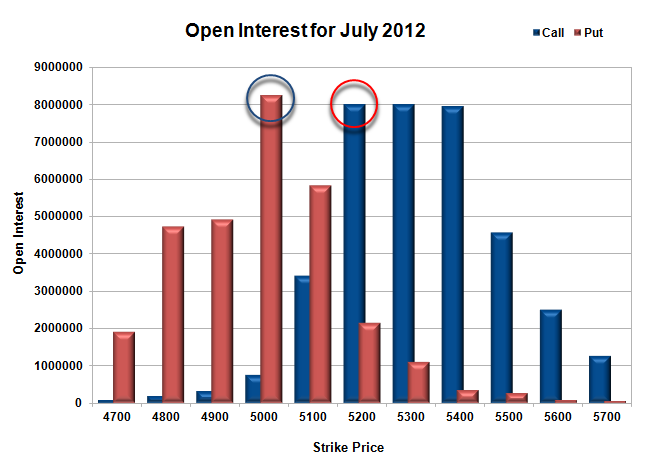 Put Option 5300-4700 added 51.2 lacs huge amount of OI, with small liquidation seen at 5400 strike price. 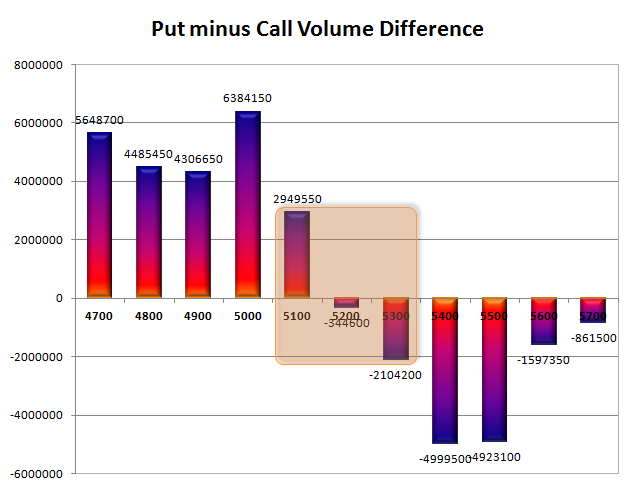 Highest accumulation on Call option 5200 at 38.2 lacs & 5500 at 36.8 lacs whereas Put option 5000 at 72 lacs & 4900 at 41 lacs. 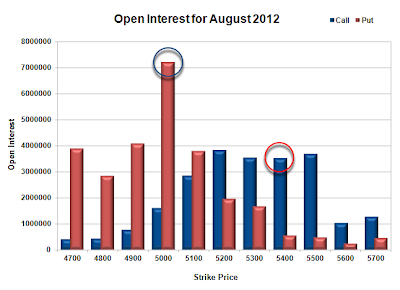 Nifty Open Interest is at 2,05,46,600 up by 51,92,650 with decrease in price, 100% rolled over from July with huge short build-up. Bank Nifty Open Interest is at 26,04,925 up by 4,33,825 with increase in price, 100% rolled over from July with huge short build-up. FII’s sold huge 8.29 lacs Futures, most probably long liquidation, as their OI also decreased by 1.09 crore, and their average price per contract comes to around 5043. FII’s future open contract as on date is 4.41 lacs. 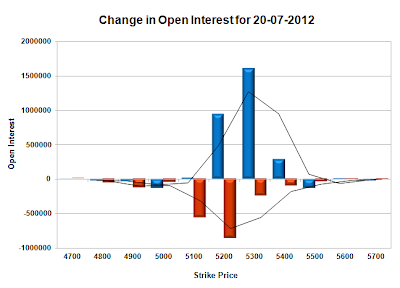 PCR Open Interest (Volume) is comfortably placed at 1.286. 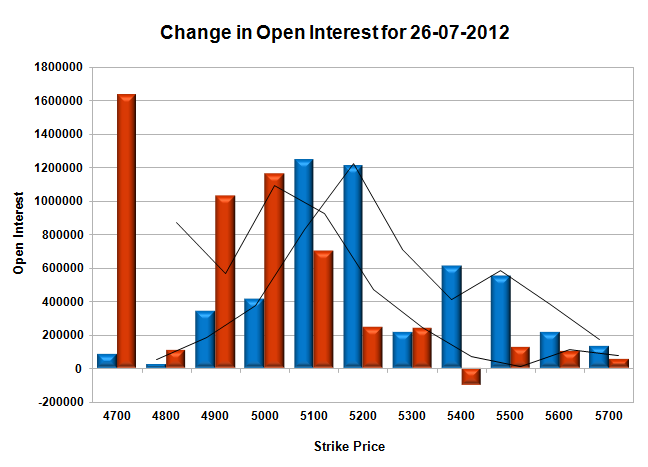 Huge Support at 5000 with OI above 72.04 lacs. Resistance at 5200, with OI of 38.16 lacs. 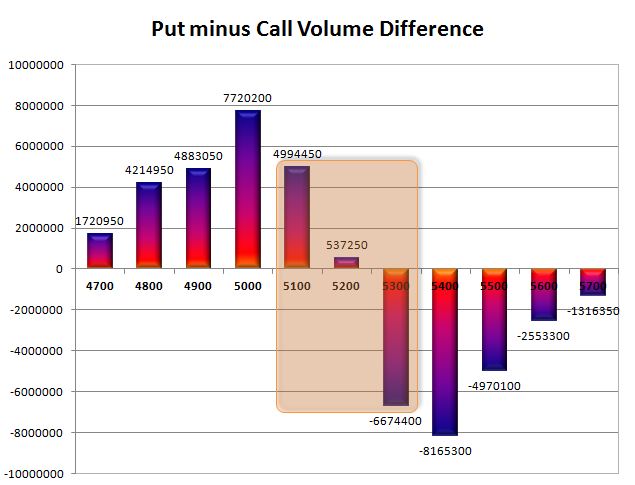 Range as per Option Table is 5012 -5122 and as per VIX is 5000 - 5086 with 5070 as the Pivot. The index opened weak on the back of bad global cues and sold off immediately below 5100 towards 5080. The responsive buyers stepped in to move the index back above 5100, but were unable to close in green. Nifty for the day closed weak at 5109.60 a small loss of 18.60 points though at one point it was more than 50 points. The Option Table saw huge addition at 5200CE, and tomorrow being the expiry it is the ceiling. Based on OI Table a most probable expiry could be around 5100. Call option 5200 added 7.84 lacs huge amount of OI, with profit booking seen at 5300 and above strike prices. Put Option 5000 added 2.54 lacs huge amount of OI, with huge liquidation seen at 5200 and above strike prices. Highest accumulation on Call option 5300 at 80.1 lacs & 5200 at 80 lacs whereas Put option 5000 at 82.5 lacs & 5100 at 58.3 lacs. Nifty Open Interest is at 1,23,37,600 down by 46,14,250 with decrease in price, whereas August series added 43.08 lacs OI, most rolled over with small long liquidation. Bank Nifty Open Interest is at 10,82,475 down by 2,28,975 with increase in price, whereas August series added 5.9 lacs of OI, 100% rolled over with huge short build-up. FII’s sold huge 9.45 lacs Futures, most probably long liquidation, as their OI also decreased by 2.34 lacs, and their average price per contract comes to around 4983. FII’s future open contract as on date is 6.59 lacs. PCR Open Interest (Volume) just went below 1 a day before expiry at 0.999. 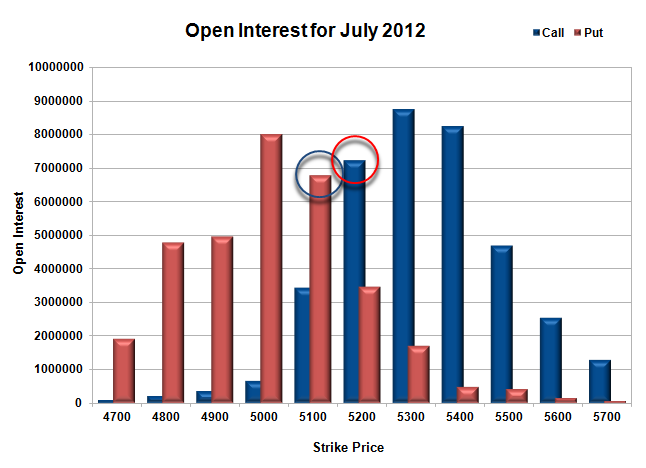 Huge Support at 5000 with OI above 82.5 lacs. Resistance at 5200, with OI of 80. Range as per Option Table is 5056 -5157 and as per VIX is 5065 - 5154 with 5130 as the Pivot. It was a quiet session after the huge sell-off of yesterday with the Index moving in a narrow range of 30 points for the better part of the day. Nifty opened up and traded above the dotted line with a dip towards 5100 being promptly bought into. Nifty closed shop just positive at 5128.20 a smallish gain of 10.25 points. The Option Table saw huge addition at 5100PE, with expiry target boiling down to around 5100 for the time being. The invincibility aura of 5300CE has been taken away with huge profit booking of 12.8 lacs. 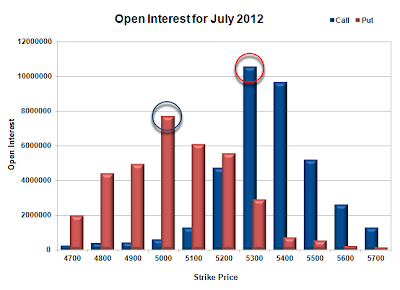 Call option 5100-5200 added a miniscule 69 thousand OI, with huge profit booking seen at 5300 and above strike prices. Put Option 5200-5100 added 6.4 lacs huge amount of OI, with huge profit booking seen at 5000 and below strike prices. 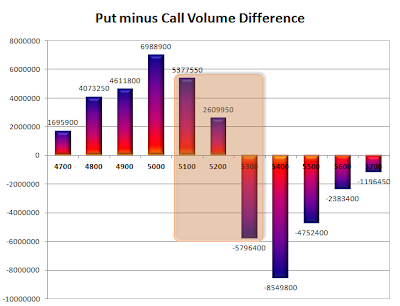 Highest accumulation on Call option 5300 at 87.6 lacs & 5400 at 82.4 lacs whereas Put option 5000 at 79.9 lacs & 5100 at 67.8 lacs. Nifty Open Interest is at 1,69,51,850 down by 50,56,850 with increase in price, whereas August series added 50.29 lacs OI, 100% rollover with small short covering. Bank Nifty Open Interest is at 13,11,450 down by 2,71,100 with increase in price, whereas August series added 3.34 lacs of OI, 100% rolled over with some long addition. FII’s sold huge 5.09 lacs Futures, most probably short build-up, as their OI also increased by 5.61 lacs, and their average price per contract comes to around 4989. FII’s future open contract as on date is 6.63 lacs. PCR Open Interest (Volume) is still holding above the ratio 1 and now placed at 1.068. Support still very much at 5100 with huge addition today and now OI above 67.8 lacs, and below that at 5000, having highest OI on PE side at 79.9 lacs. 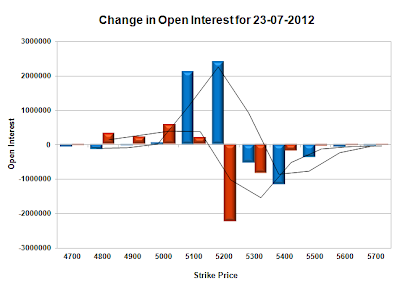 Resistance at 5200, with huge OI of 72.1 lacs and above that at 5300 with OI of above 87.6 lacs. 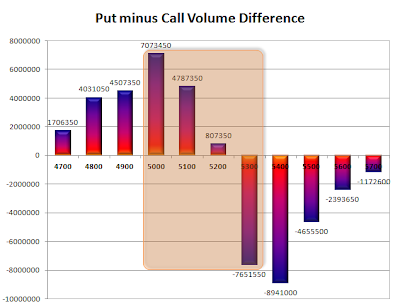 Range as per Option Table is 5078 -5179 and as per VIX is 5083 - 5174 with 5150 as the Pivot. The last week addition at 5200-5300CE was not a flash in the pan, with the Bears today hammering Nifty down by 87.15 points on the back of favourable global cues to 5117.95. Nifty was just able to hold on to the psychological level of 5100 for the day, but the way CE writers have gone about their jobs, looks like it will be captured in the next trading session. The Option Table saw hug-huge addition at 5100-5200CE and liquidation at 5200PE, with the Table in a sea of red. Call option 5100-5200 added 45.3 lacs huge amount of OI, with profit booking seen at 5300 and above strike prices. Put Option 5100-4800 added 13.3 lacs huge amount of OI, with huge liquidation seen at 5200 and above strike prices. Highest accumulation on Call option 5300 at 1.00 crore & 5400 at 85.1 lacs whereas Put option 5000 at 82.8 lacs & 5100 at 62.9 lacs. Nifty Open Interest is at 2,20,08,700 down by 12,96,350 with decrease in price, whereas August series added 17.96 lacs OI, mostly 100% rollover with huge short build-up. Bank Nifty Open Interest is at 15,82,550 down by 4,15,525 with decrease in price, whereas August series added 3.35 lacs of OI, mostly rolled over with some long liquidation. FII’s sold huge 10.3 lacs Futures, most probably short build-up, as their OI also increased by 7.73 lacs, and their average price per contract comes to around 4961. FII’s future open contract as on date is 6.52 lacs. PCR Open Interest (Volume) is precariously placed just above 1 at 1.030. Support at 5100 looks good with OI above 62.9 lacs, and below that at 5000, having highest OI on PE side at 82.8 lacs. Initial Resistance now at 5200, with huge addition of 24 lacs for the day and above that at 5300 with OI of above 1.00 Crore. Range as per Option Table is 5078 -5180 and as per VIX is 5068 - 5168 with 5160 as the Pivot. A flattish open, saw the index being sold off to the lows of the day just below 5200. The Bulls tried the whole day but were unable to move Nifty up. It was toil for the rest of the session in a narrow range of 20 points and the index ultimately closed shop at 5205.10, a loss of 37.60 points. On a week on week basis the index lost 22.15 points or 0.42%. The Option Table saw hug-huge addition at 5200-5300CE and liquidation at 5200-5100PE, with the OI Table completely in the hands of the Bears. 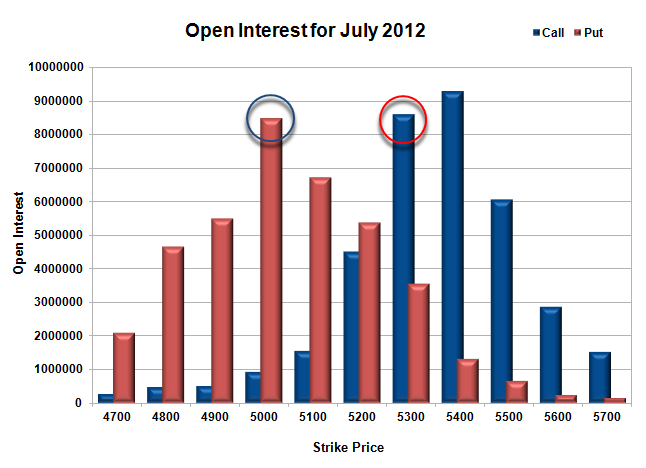 Call option 5100-5400 added 28.6 lacs huge amount of OI, with profit booking seen at 5500 and above strike prices. Put Option 5100-5400 saw huge liquidation of OI, with small profit booking at lower levels. Highest accumulation on Call option 5300 at 1.06 crore & 5400 at 96.7 lacs whereas Put option 5000 at 77 lacs & 5100 at 60.1 lacs. Nifty Open Interest is at 2,33,05,050 down by 4,29,500 with decrease in price, most probably huge long liquidation. Bank Nifty Open Interest is at 19,98,075 down by 1,58,475 with decrease in price, most probably huge long liquidation. FII’s sold huge 4.62 lacs Futures, most probably long liquidation, as their OI also decreased by 1.20 lacs, and their average price per contract comes to around 5039. 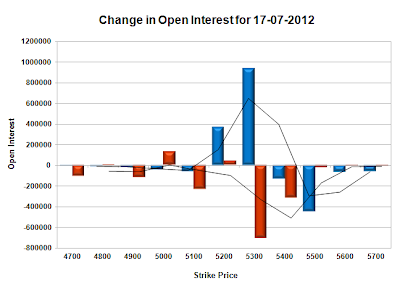 PCR Open Interest (Volume) is again below 1,2 and now at 1.140. Support at 5200 looks vulnerable with huge liquidation for the day and below that at 5100 and 5000, having highest OI on PE side at 77 lacs. 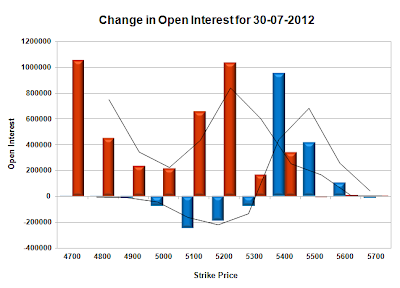 Huge Resistance at 5300, with OI now above 1.05 Crore. Range as per Option Table is 5163 -5261 and as per VIX is 5159 - 5251 with 5220 as the Pivot. A perfect gap-up and then consolidation for the day was the norm for Nifty today. The range was just 24 points and small dip towards 5235 was promptly bought into. Nifty closed the day with a gain of just 26.40 points at 5242.70 with the Bears unable to make any kind of impact. The Option Table saw huge liquidation at 5200 and 5300CE and addition at 5200PE. Call option 5400 added just 1.1 lacs of OI, with liquidation seen at 5300 and below levels. Put Option 5200-5300 added huge 12.9 lacs of OI, with huge profit booking seen at 5100 and below levels. Highest accumulation on Call option 5400 at 93.8 lacs & 5300 at 89.7 lacs whereas Put option 5000 at 77.5 lacs & 5100 at 66.5 lacs. Nifty Open Interest is at 2,37,34,550 down by 1,05,250 with increase in price, most probably huge short covering. 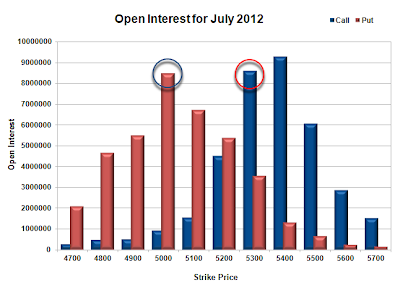 Bank Nifty Open Interest is at 21,56,550 down by 3,07,425 with increase in price, most probably huge short covering. FII’s bought juge 14 lacs Futures, most probably long build-up, as their OI also increased by 16.68 lacs, and their average price per contract comes to around 5071. FII’s future open contract as on date is 6.39 lacs. 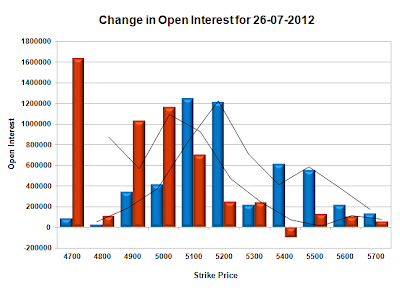 PCR Open Interest (Volume) has started increasing and now at 1.272. Support just went up at 5200 with huge addition of 8.96 lacs at 5200PE and below that at 5100 and 5000, having highest OI on PE side at 77.5 lacs. Resistance is still at 5300, though a small profit booking was seen and above that at 5400 with highest OI of above 93.8 lacs. Range as per Option Table is 5196 -5296 and as per VIX is 5198 - 5288 with 5240 as the Pivot. Nifty opened on flat note, but was sold of instantly to the lows of the day at 5170, but the responsive buyers took control and moved the index in green and above the psychological level of 5200 to close at 5216.30 a gain of 23.45 points. The Option Interest Table did not see much of a change, the only redeeming point for Bulls was the huge liquidation seen at 5200CE. 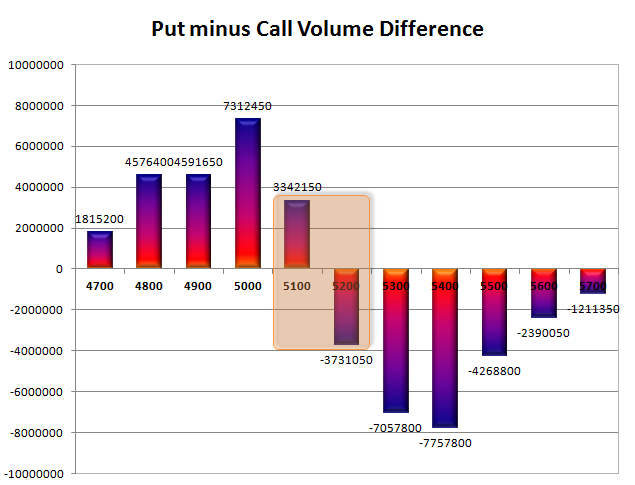 Call option 5400 added just 1.08 lacs of OI, with liquidation seen at 5300 and below levels. Put Option 5100-5200 added huge 3.89 lacs of OI, with huge profit booking seen at 5000 and below levels. Highest accumulation on Call option 5300 at 94.2 lacs & 5400 at 92.7 lacs whereas Put option 5000 at 84 lacs & 5100 at 67.8 lacs. Nifty Open Interest is at 2,38,39,800 down by 4,78,450 with increase in price, most probably huge short covering. 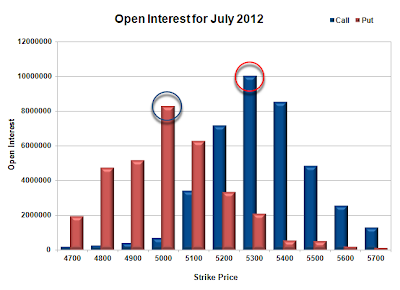 Bank Nifty Open Interest is at 24,63,975 down by 1,68,275 with increase in price, most probably huge short covering. FII’s sold 5.2 lacs Futures, most probably long liquidation, as their OI also decreased by 2.60 lacs, and their average price per contract comes to around 5058. FII’s future open contract as on date is 6.06 lacs. PCR Open Interest (Volume) just went above the danger level of 1.2 and now at 1.225. 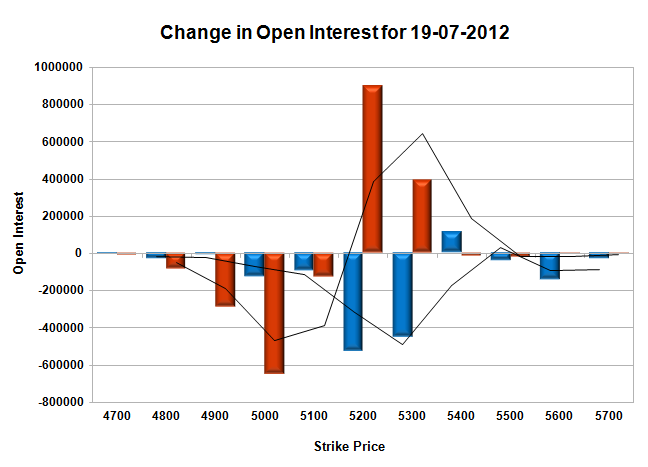 Support right now at 5100 looks good with OI of 67.8 lacs, below that at 5000, having highest OI on PE side at 84 lacs. 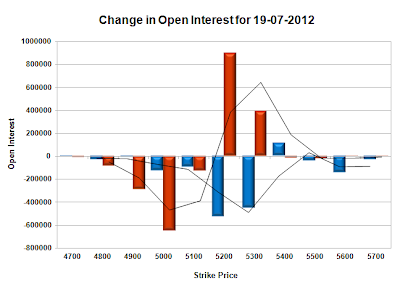 Resistance at 5300 with highest OI of above 94 lacs. Range as per Option Table is 5156 -5258 and as per VIX is 5169 - 5264 with 5220 as the Pivot. Nifty opened up on good global cues but the Bulls were unable to hold onto the gains and surrendered all meekly to the Bears, with the index ultimately closing in red at 5192.85. The Nifty closed below the psychological level of 5200 for second day in a row and now looks weak with CE writers taking full charge of the OI Table. Call option 5200-5300 added 13 lacs huge amount of OI, with profit booking seen at 5400 and above levels. Put Option 5000 added just 1.28 lacs of OI, with huge liquidation seen at 5100 and above levels. Highest accumulation on Call option 5300 at 95.2 lacs & 5400 at 91.6 lacs whereas Put option 5000 at 86.1 lacs & 5100 at 65 lacs. 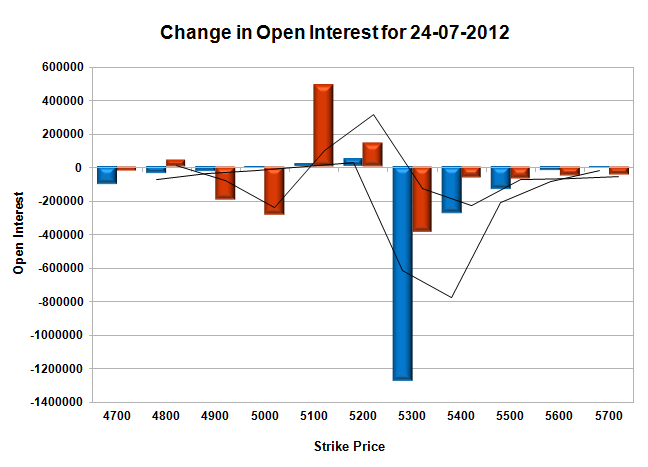 Nifty Open Interest is at 2,43,18,250 up by 3,71,650 with decrease in price, most probably huge short build-up. Bank Nifty Open Interest is at 26,32,250 down by 76,875 with decrease in price, most probably huge long liquidation. FII’s bought 2.8 lacs Futures, most probably long build-up, as their OI also increased by 8.77 lacs, and their average price per contract comes to around 5033. FII’s future open contract as on date is 6.11 lacs. PCR Open Interest (Volume) has dropped below the danger level of 1.2 and now at 1.198. 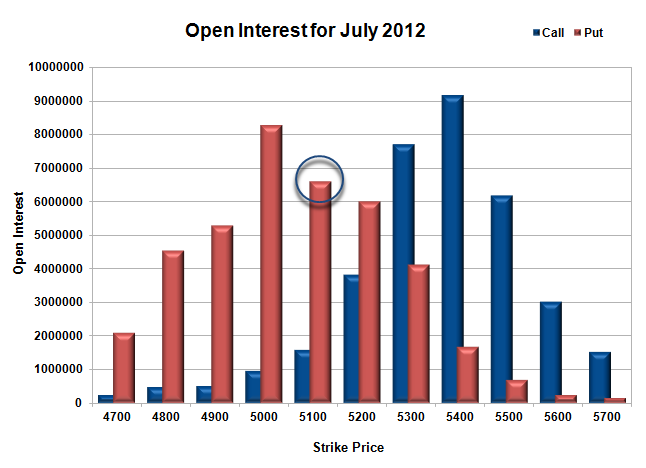 Support right now at 5100 looks good with OI of 65 lacs, below that at 5000, having highest OI on PE side at 86.1 lacs. 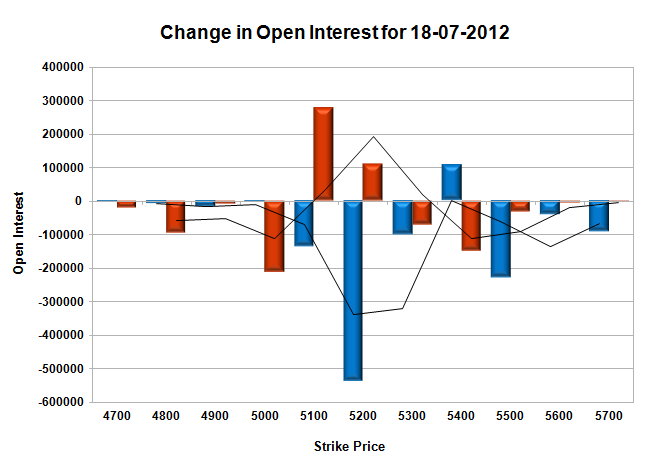 Resistance at 5300 got a gigantic proposition with OI now above 95 lacs. Range as per Option Table is 5150 -5253 and as per VIX is 5145 - 5241 with 5220 as the Pivot. Nifty opened flat just above the dotted line but was sold off immediately towards 5200 level, but a better than expected WPI data at 7.25% against an expectation of 7.62% saw the index surge towards 5250 level. The euphoria evaporated on weak opening of Europe and Nifty nose-dived to the lows of the day to close at 5197.25 a loss of 30.00 points. The OI Table saw huge addition at 5200-5300CE strike and now 5300CE with a OI of above 85.9 lacs looks like a huge barrier to the Bulls. Call option 5200-5400 added 16.9 lacs huge amount of OI, with profit booking seen at 5500 and above levels. Put Option 5100-4800 added 6.74 lacs huge amount of OI, with huge liquidation seen at 5200 and above levels. 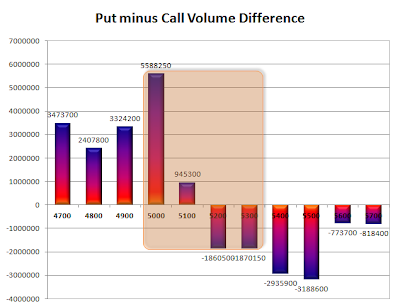 Highest accumulation on Call option 5400 at 92.9 lacs & 5300 at 85.9 lacs whereas Put option 5000 at 84.8 lacs & 5100 at 67.3 lacs. Nifty Open Interest is at 2,39,46,600 up by 1,98,900 with decrease in price, most probably huge short build-up. Bank Nifty Open Interest is at 27,09,125 down by 17,175 with decrease in price, most probably huge long liquidation. FII’s bought small 62.9 thousand Futures, most probably long build-up, as their OI also increased by 1.78 lacs, and their average price per contract comes to around 5043. FII’s future open contract as on date is 5.93 lacs. PCR Open Interest (Volume) has dropped near to the danger level of 1.2 and now just above at 1.244. 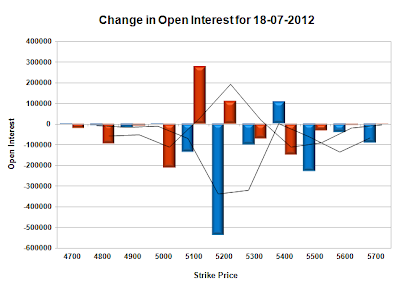 Support has shifted down to 5100, with huge OI of 67.3 lacs, below that at 5000, having highest OI on PE side at 84.8 lacs. Resistance at 5300 just got bigger, with huge addition of 8.8 lacs for the day and above that at 5400 with highest OI of 92.9 lacs. Range as per Option Table is 5157 -5260 and as per VIX is 5146 - 5248 with 5220 as the Pivot. Nifty opened strong above the previous day’s close on good global cues but started selling off from the word go. During the afternoon, it breached previous day’s closing level and closed the day weak at 5227.25 a small loss of 8.00 points. On a week on week basis the index lost 89.70 points or 1.69%, in the process breaking the momentum of the last 5 weeks. The OI Table saw huge liquidation at most PE levels and huge addition at 5300-5400CE and now 5400 level has OI in excess of 90 lacs and is the resistance for the series. 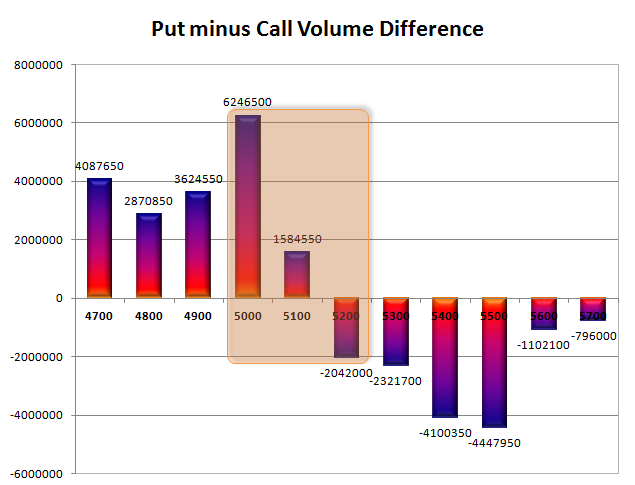 Call option 5300-5400 added 15.3 lacs huge amount of OI, with huge profit booking seen at 5500 and above levels. Put Option 4900 added4.28 lacs huge amount of OI, with huge liquidation seen at 5000 and above levels. Highest accumulation on Call option 5400 at 91.6 lacs & 5300 at 77.1 lacs whereas Put option 5000 at 82.8 lacs & 5100 at 66 lacs. 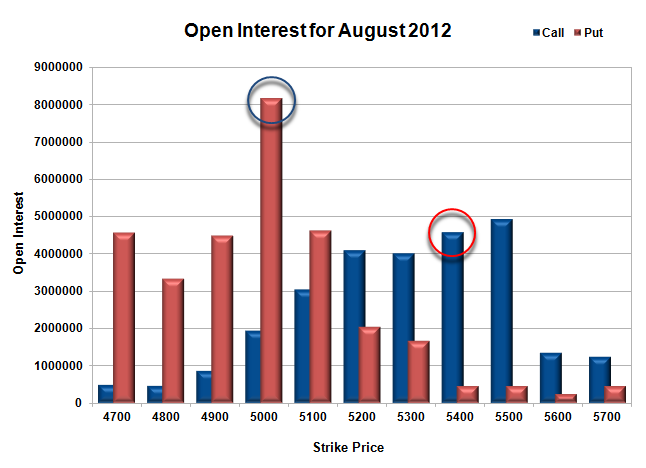 Nifty Open Interest is at 2,37,47,700 up by 4,48,100 with decrease in price, most probably huge short build-up. 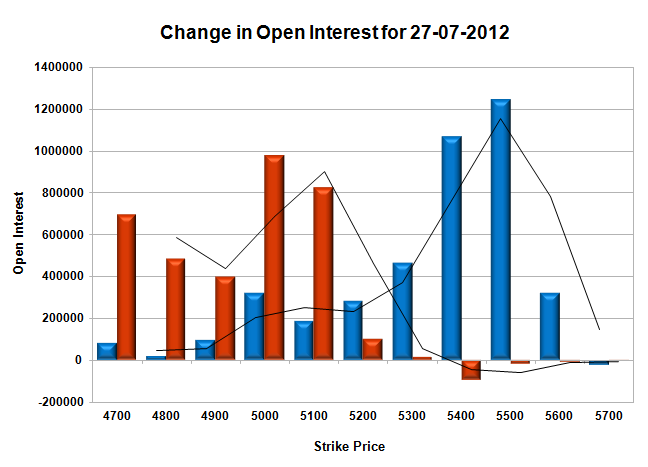 Bank Nifty Open Interest is at 27,26,300 down by 56,875 with decrease in price, most probably huge long liquidation. FII’s sold 81.75 thousand Futures, most probably short build-up, as their OI also increased by 6.41 lacs, and their average price per contract comes to around 5067. FII’s future open contract as on date is 5.90 lacs. PCR Open Interest (Volume) is dropping fast and now at 1.315, lowest of the series. Support is still at 5200, though it has weakened quite a bit with huge liquidation of 6 lacs, below that at 5100, having OI around 66 lacs. 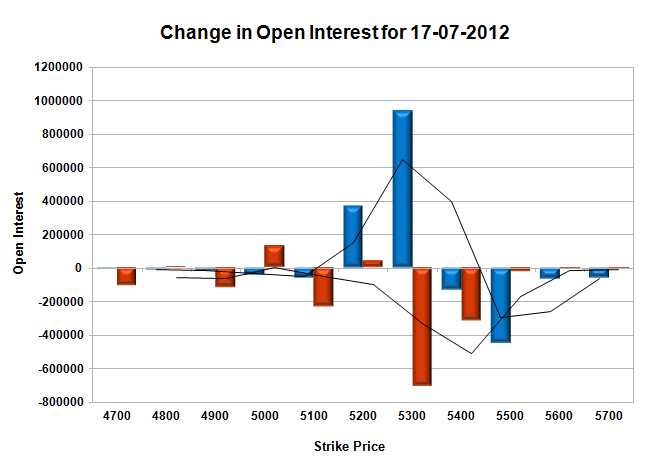 Resistance is at 5300, with huge addition of 7.6 lacs for the day and above that at 5400 with highest OI of 91.6 lacs. Range as per Option Table is 5184 -5285 and as per VIX is 5177 - 5277 with 5260 as the Pivot.